Influenster is the sampling site that sends free items for you to try. There is no catch to trying the free items other than the request that you review the item(s) and complete a short exit survey. For minimal effort, you get items in a free VoxBox selected based on your profile and qualification survey. Sometimes the items are brand new to you, and those are the items I most look forward to, not that I mind receiving extras of items I already know and love. My most recent VoxBox gave me the opportunity to try the Dessange Haircare line. Prior to receiving it in my VoxBox, I had never heard of the brand. After researching it, I learned it was yet another line in the impressive Loreal brand. I instantly fell in love with the shampoo and conditioner. Since testing it, I now see it pop up often. It is only sold at Target, but luckily for me, that is where I shop the most. This has been a Cartwheel offer twice, and I’ve even seen a Target coupon pop up. I also walk into the hair care aisle on certain trips to see what other items Dessange has to offer. I knew once I tried my first Dessange product that I needed to try more. While loading my Cartwheel offers, as I do every Tuesday, I saw that Dessange had an entry for 25% off. If you shop at Target and do not have a Cartwheel account, you should really consider signing up. You digitally clip the coupons that interest you. At checkout, the employee simply scans your Cartwheel bar code and all eligible clipped coupons will automatically be removed. While you’re loading your digital coupons, remember to check the physical coupons. Occasionally, there will be separate offers for both, and they can be combined. That was the exact offer I needed to entice me to try more items from the brand. The online choices were more plentiful than what was available in my store. 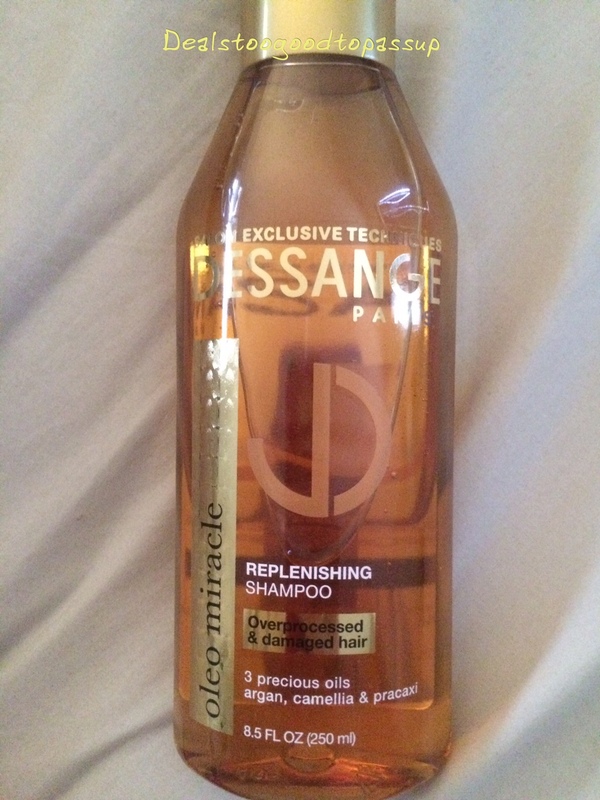 As my first choice, the Dessange Paris Solar Blonde Naturale Brightening Shampoo, was not in the store, I selected my second choice, Dessange Paris Oleo Miracle Replenishing Shampoo. It retails for $9.99, but with the 25% off my beloved Cartwheel offer saved me, I paid $7.49. At 8.5 ounces, I like that the offer made this less than $1 an ounce. Shortly after I purchased this, I saw a physical coupon for $3 off that overlapped with 25% off Cartwheel offer. The problem is I did not get into Target within the proper time frame. I instantly liked this shampoo as well, but I admit I liked the original one from the VoxBox better. This was does not smell as good and does not make my hair as shiny or tame the frizz as much the other one did either. While it is a good enough product that I would buy it again, I would prefer the original one or the one I wanted to buy but could not first. It was still nice to try it, so I am very glad Influenster introduced me to this brand. Luckily, I am making a trip to a different Target than my usual one today, so I look forward to seeing if the one I wanted to buy was in stock. While the 25% Cartwheel offer and the $3 physical coupon are no longer available, there is still a 10% discount in Cartwheel that I will be able to take advantage of it the shampoo I want is back in stock. Remember to check all offers before placing online orders. See all Target and Influenster articles. View my main page for the guide map to the site and deeper deal exploration. How do you actually sign up for the voxbox part? There is a two step process. First, they have to think your profile is a fit for the product. Secondly, your pre-qualification survey must be what they are looking for. Surveys are very short and always take about 2-5 minutes total. If they do not think your profile is a fit, you will not even get a pre-qualification survey. I’ve found that more often than not you will get the item as long as you complete the survey.